House lawmakers are pushing the Homeland Security Department to hire 10,000 new employees, doubling a request initially made by President Trump. The 2017 Border Security for America Act (H.R. 3548) would authorize Customs and Border Protection to hire 5,000 new Border Patrol agents and an additional 5,000 customs officers. The former mandate is one Trump required through executive order in January. Trump’s order also called for Immigration and Customs Enforcement to onboard 10,000 new agents, but did not address customs officers. The House Homeland Security Committee approved the measure this week. It would, by 2021, set the floor for Border Patrol agents at 26,370 and authorize 27,725 customs officers. It also authorizes Trump’s proposed wall along the U.S.-Mexico border, providing $10 billion for “the deployment and construction of tactical infrastructure and technology to achieve full operational control and situational awareness.” Four companies began recently began constructing prototypes for the wall in California. CBP has been working to meet Trump’s required hiring spree since then-DHS Secretary John Kelly issued guidance in February. A rigorous onboarding process and recruiting difficulties have hampered those efforts, but CBP has already boosted its outreach efforts and sought special pay authority to incentivize potential applicants. Progress on the effort is off to a rocky start, as Congress reduced funding for the agency's hiring by $200 million in the fiscal 2017 spending bill after agency officials told lawmakers they would hire 3,000 fewer agents than initially projected. The DHS inspector general has estimated that based on current hiring and attrition rates, CBP would need 750,000 applicants to fill Trump’s order. It is, however, adjusting its polygraph test and reforming its training process. Agency leadership has said the average application processing time has decreased from 400 days in 2014 to 160 days today. 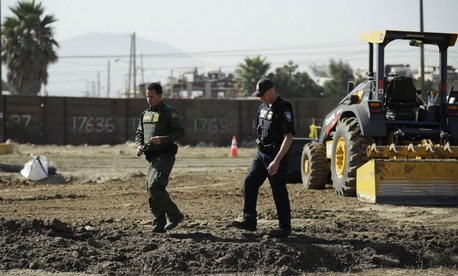 The House Appropriations Committee has approved a fiscal 2018 spending bill that would provide $100 million for the Border Patrol to hire 500 new agents and $186.5 million for Immigration and Customs Enforcement to boost its ranks by 1,000 officers next year. It did not, however, provide any funds for additional customs officers. In 2016, Obama administration officials testified to Congress that workforce models suggested CBP needed 2,100 new customs officers. That figure was on top of the 2,000 officers Congress had authorized in a fiscal 2014 omnibus spending bill, positions the agency has struggled to fill. Trump’s fiscal 2018 budget called for an increase of just 63 CBP officers to support National Targeting Center operations. Jennifer Gabris, a CBP spokeswoman, said in July that the agency is focusing on filling the 1,400 positions still vacant from hiring authorized in 2014. A Homeland Security Committee aide said the 5,000 figure was based on updated CBP workflow staffing models, which indicated the need for the nationwide increase. Federal employee unions praised the committee for approving the legislation. Tony Reardon, president of the National Treasury Employees Union, which represents 25,000 CBP employees, said in a letter to committee members his organization” “strongly supports” the proposed staffing surge. The National Border Patrol Council said the measure would provide a “desperately needed” boost to the agency’s workforce and infrastructure.